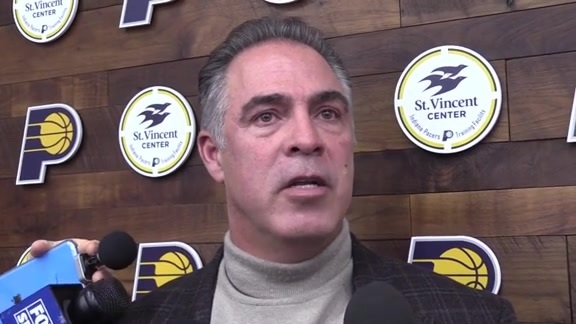 Kevin Pritchard could have overhauled the Pacers' roster before Thursday's NBA trade deadline. He has several proven veteran players with contracts that expire at the end of the season, and fielded several phone calls inquiring about them earlier this week. Ultimately, he didn't see the point of breaking up a team that's in third place in the Eastern Conference and wants to be together both on the court and off. "More inbound calls to us than outbound calls," Pritchard said Friday when asked if he had seriously considered any offers for his rotation players. "Other executives thought there was a chance (we would) blow it up, but we cut that down very fast. "We want to compete. We're in third place in the East right now. It would have been hard for me to walk into that locker room and say, 'Guys, we're going to trade four players and look to the future.' That's not fair to these guys. From what they've put out this year and how proud we are of them … it kind of tells me this team wants to be together." The Pacers take a four-game winning streak and a 36-19 record into Saturday's game against Cleveland. They dominated their previous two opponents, the Lakers and Clippers, and while neither of those teams were in peak form mentally and/or physically because of trade rumors and trade realities, the Pacers were impressive mostly by not letting up. They beat the Lakers on Tuesday by 42 points and the Clippers on Thursday by 24. Last season, or even earlier this season, they would have been prone to relaxing too much with their comfortable leads and allowed the game to become closer than necessary, but they maintained their intensity throughout both. Pritchard took the effort against the Lakers, less than 48 hours before the trade deadline, as the players' way of telling him to keep them intact, and a reflection of their competitive desire. "We're going to be tested in March. But we're going to be a playoff team and we'll be a tough out in the playoffs." The Pacers have four more home games on their current six-game residence at Bankers Life Fieldhouse, which extends past the All-Star break. Between March 7-29, however, they play eight-of-11 games on the road. All but one of those 11 opponents currently have a winning record. Pritchard was unable to address in detail reports of the acquisition of a free agent. He said the player expected to join the Pacers has cleared waivers, but has not signed a contract. "Pretty shortly we'll be able to talk about that," he said. "We feel he's a great fit, but it's not done until it's done." The Pacers banded together well enough to hold off Toronto after Victor Oladipo went down with a ruptured quad tendon in the second quarter on Jan 23. But they proceeded to lose their next four games, three of them on the road. Now they've won four in a row and appear to have regained the chemistry they displayed earlier in the season in winning eight of 12 games without Oladipo, including the game against Atlanta in which he was injured in the first quarter. Young admitted it took time to get over the shock of losing Oladipo. "We were like, 'Did that really happen?'" Young recalled. "We had to get out of that phase and get into the next phase." Just as the first time they played without Oladipo this season, they've succeeded with balance. Bojan Bogdanovic has had games of 31, 24 and 29 points. Darren Collison had games of 22 and 20. Myles Turner has hit 16-of-20 shots in the previous two games, including all six 3-point attempts, and blocked 10 shots. "We're moving the ball around and feeding off each other's energy," Young said. "I've been putting a big emphasis on myself to make sure I'm not going one-on-one. I'm passing up shots to get other guys shots because I know it gets the juices flowing for everybody." Young often brings up the term "unified spirit" to describe the team's current state. Their teamwork at both ends has reflected that, particularly against the Lakers and Clippers. "We're getting back to that," Young said. "There's still room for improvement. We still feel we can be 10 times better. We're striving for perfection each and every day. We know we're not going to be perfect but that's what we want to strive for." It's become nearly routine in recent weeks for Bogdanovic to get a backdoor layup early in the game, if not on the first possession. He and Young make eye contact, he runs off Collison's screen on the wing, and hits a layup. It happened 44 seconds into Thursday's game, for example, and 29 seconds into Tuesday's game. "Ssshhhh," Collison said with a smile following Thursday's victory. "We've got a good thing going." Young smiled, too, when the subject was brought up following the win over the Lakers. Bogdanovic's layup comes off a read more than a play call, and reflects the rapport he and Young have established. "Me and Bogey played together in Brooklyn; I know exactly how he plays," Young said. "He's coming off a curl, I'm like (motioning with his head) and I hit him with a late pass. Me and Bogey just have a good feel for how to play with each other. I know just who he is as a player." Collison believes the easy points early in the game have contributed to Bogdanovic's improved shooting (33-of-47) during the winning streak. "It's good for him because as a shooter you see that first one go in like that, your eyes light up," Collison said. Young's shooting has improved as well. After hitting 24.5 percent of his 3-point attempts over the season's first 39 games, he has hit 50 percent (15-of-30) in the previous 14. "Just sticking with it," he said. "Continuing to work on it each and every day. Staying confident. Being ready to shoot. And just not caring about it when I am taking a shot. "Earlier in the season I was worrying too much about things and I had to lock in on things I've always been able to do well. Right now I'm playing at a high level and I want to continue to do that for the rest of the season." Cleveland has the NBA's third-worst record (11-43) heading into Friday's game at Washington, barely ahead of New York and Phoenix. The Pacers, however, only need to look back on their homecourt loss to the Cavs on Dec. 18 to remind themselves not to assume too much. "We've definitely had our eyes on this game," Young said. "We can't look at who's on their roster and how their roster compares to ours." Doug McDermott, who has missed the previous four games with bruised ribs, participated in a halfcourt scrimmage on Friday and could be available for the game. "We're going to see how he wakes up and feels tomorrow," coach Nate McMillan said. "There's a possibility he could play tomorrow." 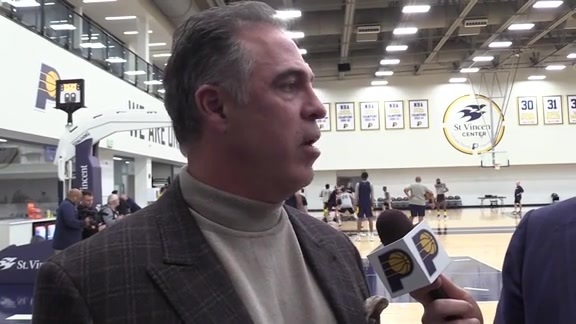 Kevin Pritchard on Trade Deadline: "We're In Here to Win"